Winter is the season of eating and eating. We are always hungry with a constant need to munch on something. This calls for healthy alternatives that are low on calories so that we can eat to our heart’s desire but without any guilt. As the saying goes ‘breakfast like a king, lunch like a prince and dinner like a pauper’. But that does not mean that you skip your dinner altogether. The best way to keep your dinner light and healthy this winter is to treat yourself to a bowl of steamed vegetables. Steaming the veggies, helps preserve the nutrient content in them. Vegetables are low in calories and are a good source of vitamins and minerals. This meal is filling and at the same time not too heavy. There is in fact no better time than winter to enjoy some green leafy vegetables and stay healthy. Rich in protein, vitamins and dietary fibres, nuts can easily be called the healthiest instant snacks. Nuts are classified as warm food and are best consumed in winter. The best thing about nuts? Well, you get tons of options to choose from. But don’t get disheartened if you are allergic to peanuts because you still have almonds, walnuts and many more to indulge in. Each of these have different health benefits. Another popular and a very healthy trend is that of seeds and grams, high on nutrients but low on calories. Chia seeds, pumpkin seeds, roasted grains and grams make perfect snacks for winters. 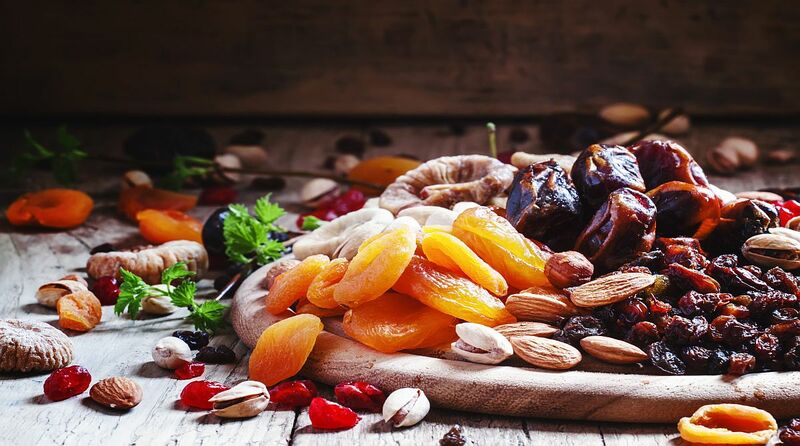 Additionally, you can indulge in Trail Mix which is a hearty combination of nuts, seeds and dried fruits. A heavy and a filling breakfast is necessary to keep you energised throughout the day. A healthy breakfast which is low on calories but rich in protein and other dietary fibre is what we all need. This winter, have a steaming bowl of oats, a very rich source of protein, to start your day right. Another alternative is muesli, with a mixture of healthy ingredients like oats, dried fruits, nuts and grains, it is the perfect choice for the health conscious. Choose your cereals wisely and have them with curd, yogurt, almond mil or soy milk. Sweeten things up a little and have a bowl of fresh fruits to complement your breakfast. Cosied up in our blankets, we all are guilty of enjoying hot chocolate or coffee in winter. But high on sugar and caffeine, these drinks are definitely not a very healthy beverage pick. This winter, opt for a healthy and delicious alternatives – like green tea and infusion teas. With high anti-oxidant content and nutrients, green tea is the best drink to enjoy in winter. When paired with exercise, It also helps in weight loss, and is also good for diabetics and for people suffering from heart diseases. Stay warm and healthy with this delicious beverage. It does not matter if it is winter or any season of the year. Fruits never go wrong as it has abundance of minerals, calcium, iron, vitamins, etc. Fruits are good for any time of the day, whether it be a delicious bowl of fruit salad for breakfast, evening snacks or a solution to your midnight hunger pangs. Fruits also keep your body energised without adding unnecessary calories.